19mm thick worktop is resistant to molten solder, organic solvents, weak acids, alkali, petrol and oil. Steel tube and sheet sectioned framework meet BS6323, EN 438, 14 and 16 SWG requirements. Surfaced with 0.9mm high pressure Electrostat anti-static laminate, bonded to MDF with a static dissipative resistance to ground of: 1 x10-4 to 9 x 10-6 Ohms. 4 adjustable, protective feet and earth grounding cord. Abrasion and scratch-resistant finish throughout. Full range of accessories available for above and below the workbench, to suit any working or storage need. Please see the Accessories tab to view the range. 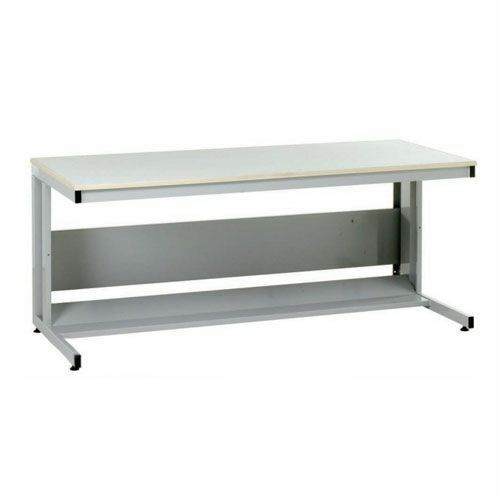 Anti-static workbench with a 300kg UDL and a fully welded cantilever frame.